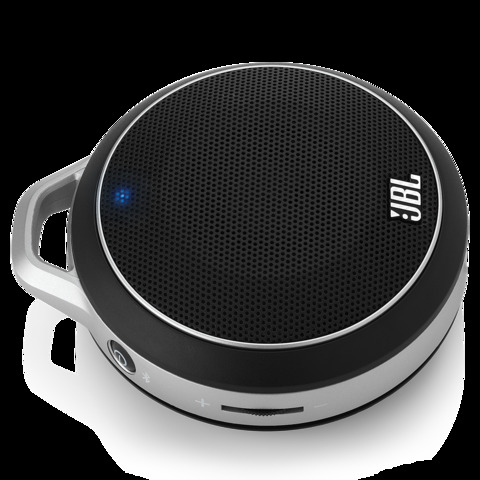 JBL’s $59 JBL Micro Wireless, available in black or metallic green, blue, or red, is a very good, very portable Bluetooth speaker. At just 3.3 inches in diameter and 1.6 inches thick, and weighing just 4.5 ounces, it’s small enough to fit in a large pocket. I reviewed the black Micro Wireless, which—like the units in other colors—features silver accents with black buttons. Along the perimeter of the speaker, you’ll find a 1/8-inch (3.5mm) auxiliary-output jack (more on that in a moment), a power/pairing button, a good-old-fashioned volume dial, and a Micro-USB port. You use that last in tandem with the included USB cable for charging the the Micro Wireless. JBL says you’ll need two hours to charge the speaker, and that you should expect up to five hours of playback time on a full charge. I frequently got even longer battery life. Just behind the speaker grill, near the top of the Micro, sits a single, multipurpose LED. That LED indicates when the unit is pairing, charging, or plugged in, as well as when the battery level gets low. I’d prefer a multi-LED status indicator, which can give a more nuanced picture of how much battery life remains. On the underside of the Micro Wireless, nestled tightly, is a 1/8-inch miniplug with a 10.5-inch cable that wraps snugly inside a thin groove around the edge of the speaker. You can connect that plug to the headphone jack of any device to listen sans Bluetooth. Inside the Micro Wireless is a 5/8-inch driver and a hidden bass port. Don’t get any ideas: The latter doesn’t allow the Micro Wireless to achieve a significant bass effect. However, for its size—and its price!—the speaker generates sound that’s entirely enjoyable to listen to. The Micro Wireless’s maximum volume rivals that of the original Jawbone Jambox, and I’d peg its overall audio quality as roughly comparable: I like the Jambox’s bass performance a little better, but the higher frequencies seem to pop from the Micro Wireless a bit more. Given that it sports a single, small speaker, the Micro Wireless is unsurprisingly influenced by placement, so you’ll want to experiment with precisely where you put it, and maybe even how you angle it. The Micro Wireless is impressive: It offers a whole lot of sound packed into a tiny, attractive package—and the price is pretty amazing, too. Between its Bluetooth and auxiliary-input options, extreme portability, and more-than-adequate audio, it’s an attractive option for budget-conscious customers.